You’ll find here a table summing up the shipping price in accordance to the weight of the parcel. 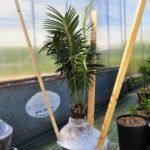 I ship plants everywhere in Europe and my customers are often worried about receiving plants by courrier, fearing the plants may get damaged whether because of insuficient packaging or because the courrier maltreats it (or both). 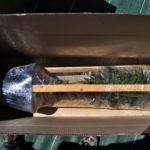 In this short article I am going to describe how I pack plants and the journey they’re going to make. Parcels will endure lots of manipulations, vibrations or even falls during their trip from my nursery to your house. 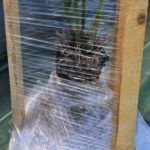 Therefore I pack plants in a way that doesn’t allow movement inside the parcel, that way plants remain safe even if the parcel ends up upside down or if another parcel falls on it. 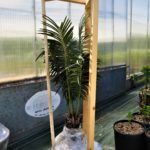 The next set of pictures show the conditioning of a Cycas sexseminifera, from the packing of the pot to prevent the soil from spiling to the setting up in an appropriate size and shape box. Unfortunately accidents happen, whether because of an improper packing on my side or because of a rough handling by the courrier… In any case we’ll try to find an amicable solution, from a discount on your next order to a full refund or replacement in case the plant would be very badly damaged. These seedlings spent 40 days barerooted in a parcel that was lost by the post. 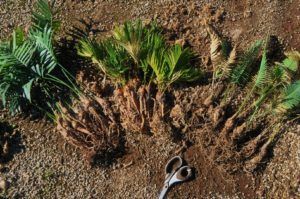 Their health is remarkably good for plants that survived thanks to the sphagnum moss around their root and without light for so long ! Even if the activity is low at the nursery in winter, I keep shipping plants everywhere in Europe. 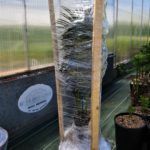 I avoid shipping during cold spells and always have a look at the climatic conditions of the destination country. 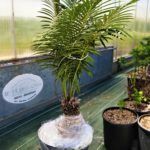 Generally speaking, most cycads can handle negative temperatures for several hours without any damage. 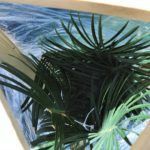 Except during cold spells, parcels are rarely exposed to very low temperatures whether because warehouses are frost free or because the parcels insulation and the thermal inertia of all the parcels is enough to protect the plants from freezing. In any case do not hesitate to send me a message to postpone shipping if needed and if there was to be an issue we would find a solution.